Controversial body camera video footage of a white Asheville police officer beating a black pedestrian on Aug. 24 has raised serious questions about public access to such footage in North Carolina. Leaked body camera video of now-former Asheville Police Department Officer Christopher Hickman, pictured here, has sparked questions about a North Carolina law prohibiting the release of police videos. Hickman is now being charged with assault of an African-American pedestrian. Photo courtesy of WLOS-TV. Since the footage has become public knowledge and gained national attention, former Asheville Police Officer Christopher Hickman faces criminal charges. The State Bureau of Investigation initially declined to investigate the case; now the Federal Bureau of Investigation is reportedly conducting an investigation. Despite the importance of the policy camera footage in this case and similar cases nationally, it cannot legally be released in North Carolina without a court order. Had it not been for the the leaked footage, it’s difficult to know whether the public might ever have learned about the incident or what was on the video. Public access to police body camera or dashboard camera footage in North Carolina underwent a major change in 2016 with the passage of HB 972, which specifically exempts such footage from the state’s open records law. So, how does the North Carolina law work, and under what conditions can footage be formally released to the public? In most cases, a record that is exempted from the open records law can still be released at the discretion of those holding the record, even though they aren’t compelled to release it. 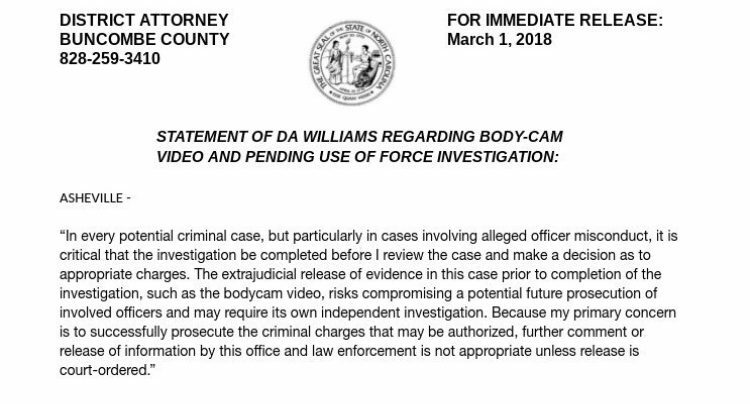 Since the passage of HB 972, however, not only is police camera footage not considered a public record, law enforcement agencies are actually prohibited from releasing the footage. Prior to HB 972, exceptions to the discretionary release principle largely included items involving confidentiality — such as records identifying or containing private information about child abuse victims, those receiving public assistance or, in some cases, public employees. Nationally, the release of this footage has been controversial for years. Some policing organizations have been unhappy with the role body cam or dash cam footage has played in some high profile cases, in which they believe it was used selectively and sensationally by news media organizations in ways that have prejudiced communities against police and incited protests that have sometimes become violent. But media advocates and those concerned about police brutality have said such complaints are like blaming the messenger, and it’s the actions of the officers who were caught on camera behaving badly that have led to problems. North Carolina legislators who passed HB 972 in 2016 apparently agreed with one or more of these arguments. This legislation constituted a break with previous iterations of state law, according to Frayda Bluestein, a professor at the UNC School of Government. As a result, HB 972 banned even the discretionary release of footage from police cameras, whether from cameras worn on an officer’s body or mounted in the dashboard of a squad car. However, the law does allow the courts to decide if the video is worthy of release. In order to obtain a copy of the video, any person may seek a court order by filing a Petition For Release. A copy of the Petition For Release can be found at ​http://www.nccourts.org/Forms/Documents/1800.pdf. In a handful of cases, North Carolina media organizations have successfully pressed such arguments. WFAE was one of the first, petitioning the courts as early as November 2016 for the release of a Charlotte-Mecklenburg Police Department recording of a police shooting. Amid a public outcry for a full official release of the video of Rush’s arrest, the city of Asheville announced March 5 that it had petitioned the Buncombe County Superior Court to order the release of body camera footage. This includes not only the footage that has become public already, but also recordings from other angles from additional officers’ body cameras. The Asheville Police Department “is not allowed to release body-worn camera recordings in the absence of such a court order” the city stated in a press release. City spokesperson Polly McDaniel told CPP on March 9 that a judge has not yet responded to the petition. Based on conversations with the city attorney, McDaniel said, a decision may take up to two weeks, since the judge will need to review all of the footage first. In the case of the Asheville footage and other police camera footage around the state, an extralegal means for the public dissemination of the footage also exists — and the law appears unable to halt this process. HB 972 is essentially toothless, with no penalties defined for those who share footage without a court order. “I suppose there is some world in which an officer might be charged with not upholding the law, since the statute is fairly clear that footage can only be released pursuant to a court order,” Amanda Martin, lead counsel for the North Carolina Press Association and a North Carolina media law expert, told CPP on March 7. 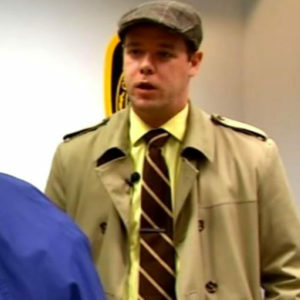 However, it’s not clear whether the source of the Asheville footage was actually an officer or someone else who somehow obtained access to the recording by legal or illegal means. It’s also unclear whether anyone is trying to determine who it was or what would happen to them if they were caught. However, in response to questions from CPP, Williams noted on March 9 that his office would not be the one to conduct such an investigation. He declined to address whether his position remained the same as it had been a week earlier. “In light of the pending charges against Officer Hickman, I will not make additional comment as to this matter at this time,” Williams said. Frank Taylor is the managing editor of Carolina Public Press. Michael Gebelein is the investigative reporter with Carolina Public Press. Contact them at 828-774-5290, or at ftaylor@carolinapublicpress.org or mgebelein@carolinapublicpress.org.